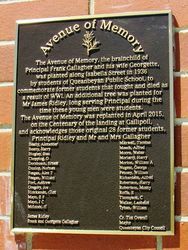 Trees commemorate former students of the Queanbeyan Public School who served in World War One. 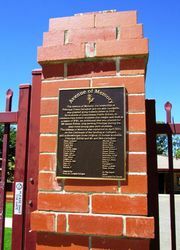 The trees were originally planted on the 2nd July 1936, with an additional tree for Mr. James Ridley who was the principal of the school at the time those honoured were students. The avenue was replanted in April 2015 on the centenary of the landing at Gallipoli. QUEANBEYAN, Thursday. The ceremony of planting 30 trees for the Avenue of Memory in Isabella-street, was organised and supervised by the Ex-Students' and the trees planted by relatives in memory of 27 fallen soldiers, who had been pupils of the Intermediate High School. Another tree was planted in memory of the late Mr James Ridley, who was headmaster of the school for about 17 years. The Legacy Club provided the treeguards. Sydney Morning Herald (NSW), 3 July 1936. 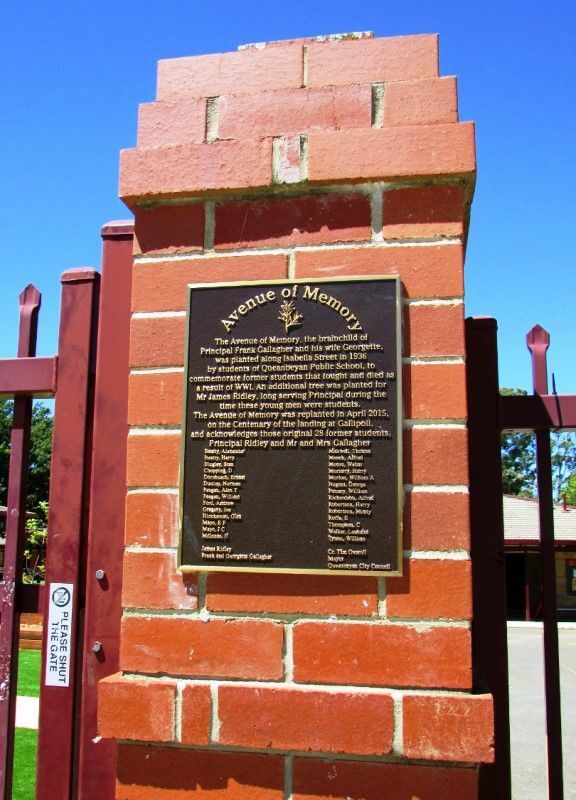 The Avenue of Memory, the brainchild of Principal Frank Gallagher and his wife Georgette, was planted along Isabella Street in 1936 by students of Queanbeyan Public School, to commemorate former students that fought and died as a result of WWI. An additional tree was planted for Mr. James Ridley, long serving Principal during the time these young men were students. Cr. Tim Overall Mayor Queanbeyan City Council.